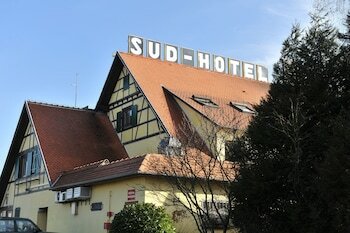 With a stay at Sud Hôtel in Huttenheim, you'll be within a 15-minute drive of Wurth Museum and Cigoland. Featured amenities include a business center, complimentary newspapers in the lobby, and luggage storage. Event facilities at this hotel consist of a conference center and a meeting room. Free self parking is available onsite. With a stay at Le Taconet in Taninges, you'll be 8 mi (12.9 km) from Museum of Mechanical Music and 8.2 mi (13.2 km) from Les Gets Ski Resort. Free self parking is available onsite. Located in Albert, Hotel de la Basilique is within a 15-minute drive of Notre Dame Basilica and Beaumont-Hamel Newfoundland Memorial. Located in Mantry, La Fontaine is within a 15-minute drive of Musee Municipal d'Archeologie and Maison du Comte. Free self parking is available onsite. When you stay at Hostellerie Bressane in Cuisery, you'll be within a 10-minute drive of Hotel-Dieu and St. Philibert Abbey. Free self parking is available onsite.